Rock is more than a four-letter word, it is a message, a statement to which many bands attest to doing, but only a handful of them succeed. The Frauds are one of them. Yes, their name might suggest that they're a group of fakes, but they are not. They claim to bring the rock, and boy, do they ever. Their self-titled debut, originally self-released in 2004, was a homage to their influences: Superdrag, The Who, Guided By Voices, Teenage Fanclub, you name it. Where one song might sound like DIY indie rock, the next can have the appeal of arena rock proportions. 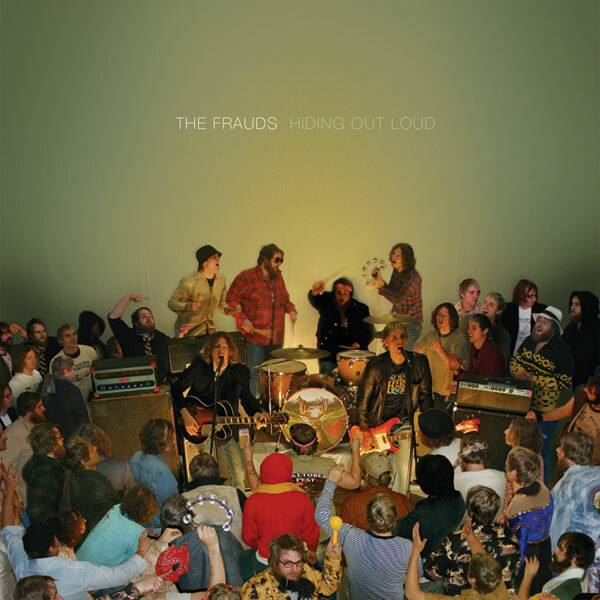 With their new album, Hiding Out Loud, the band continues the ethos brought forth on their debut, while branching out and exploring new horizons once untouched. Where the band concoct the same formula as their debut on the lead-off track "Nothing To Say" or the deep cut "I Can See The Light," they branch out and expand with the Beach Boys-esque laden harmonies of "Palm Tree Baby." Grand scales of piano and mellotron give you comfort in "Asphalt Dunegon," and the acoustic guitars wash all the pain away in "Roundtown Rose," while also balancing Loud's ferocious at times demeanor. And lest we forget the bass grooves and barking vocal that make up "Strawberry Soul", a melody that will be trapped in your mind for days. Louder. Softer. However you want them. The Frauds are back. David Hasselhoff (their two biggest influences). Rick Bowman (guitar, piano, vocals) teams up with brothers Emerson: Eric (bass, vocals) and Ernie Jr. (drums, wrenches) and new addition Jonny Watkins (guitar) to carve out their space among the new legion of DIY indie rockers in the digital age. This song is about the people who go around telling you one thing, while practicing another. Hypocrites. This song is about the girl who can't stand to be alone. The life of a chaser..
Give It Up is an intentional mismatch of punk and radio pop. 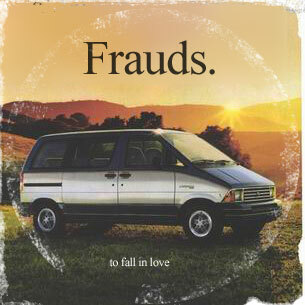 Not to be confused with Pop-punk, this tune is more experimental in arrangement and is the first Frauds track to be based around the Rhodes piano and Bass. This is a bonus track from the remastered "Frauds" album released by High Wire Music/Fontana in 2006. Like it! This song rules. That's all there is to it. e We do care, only you can..
* Your song 'The Church of Seduction' has just been added to Where in the hell is Electic, Alabama station! * Your song 'I Don't Wanna Know' has just been added to KIAC Platinum Hits station! * Your song 'The Church of Seduction' has just been added to Slow Commotion station! * Your song 'She'll Never Tell' has just been added to KIAC Hitline station! * Your song 'She'll Never Tell' has just been added to Alternative Modern Rock station! * Your song 'Nothing To Say' has just been added to Clear station! * Your song 'The Church of Seduction' has just been added to Clear station! * Your song 'She'll Never Tell' has just been added to Clear station! * Your song 'Nothing To Say' has just been added to 2009 Rock Songs Sorted! station! * Your song 'She'll Never Tell' has just been added to JUST SO station! * Your song 'She'll Never Tell' has just been added to rockalock station! * Your song 'The Church of Seduction' has just been added to rockalock station! * Your song 'Nothing To Say' has just been added to KIAC Platinum Hits station! * Your song 'She'll Never Tell' has just been added to lalala station! * Your song 'Nothing To Say' has just been added to THE NOBODIES CURSE! station! * Your song 'She'll Never Tell' has just been added to eYe station! 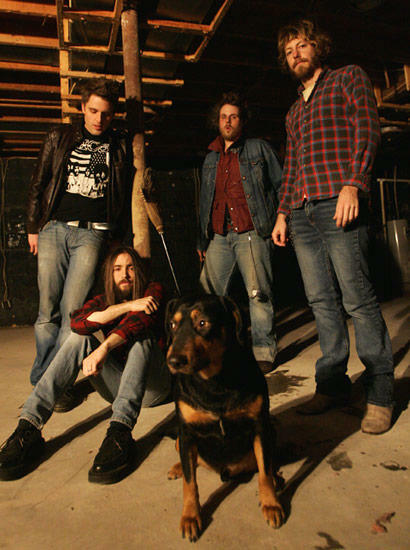 * Your song 'The Church of Seduction' has just been added to Kung Fu Indie station! * Your song 'The Church of Seduction' has just been added to Indie sound of America and beyond station! * Your song 'Nothing To Say' has just been added to KIAC Hitline station! * Your song 'Nothing To Say' has just been added to Heavy Rotation station! * Your song 'To Fall In Love' has just been added to Recool station! * Your song 'I Can See the Light' has just been added to SMASH station! * Your song 'Give It Up' has just been added to This Just In station! * Your song 'Give It Up' has just been added to Tunebec station! * Your song 'The Church of Seduction' has just been added to Sound Matters station! IAC Your song 'Nothing To Say' has just been added to Kayak Number One Songs! station! IAC Your song 'She'll Never Tell' has just been added to Kayak Number One Songs! station! IAC Your song 'She'll Never Tell' has just been added to KIAC Hitline station! IAC Your song 'Strawberry Soul' has just been added to Kayak Number One Songs! station! IAC Your song 'The Church of Seduction' has just been added to Kayak Number One Songs! station! IAC Your song 'Strawberry Soul' has just been added to KIAC Hitline station! IAC Your song 'Strawberry Soul' has just been added to The Jazz Club station! IAC Your song 'Strawberry Soul' has just been added to Indie sound of America and beyond station! IAC Your song 'She'll Never Tell' has just been added to Indigo Station station! IMP Your song 'Pull Me Over' has just been added to Kayak Number One Songs! station! IMP Your song 'Nothing To Say' has just been added to great acts station! IMP Your song 'Strawberry Soul' has just been added to they got the stuff station! IAC Your song 'She'll Never Tell' has just been added to Short Takes station! IMP Your song 'Strawberry Soul' has just been added to Veronica station! IMP Your song 'The Church of Seduction' has just been added to Kayak Classics station! IMP Your song 'Roundtown Rose' has just been added to Choice station! IMP Your song 'Strawberry Soul' has just been added to Kayak Classics station! IMP Your song 'Nothing To Say' has just been added to Kayak Classics station! IMP Your song 'She'll Never Tell' has just been added to Kayak Classics station! IMP Your song 'Nothing To Say' has just been added to Please Come Back station! IMP Your song 'The Church of Seduction' has just been added to The Best Artists In the World station!